Let us have your details and we will let you know when each date approaches. If you get voice mail please leave your name and number. Note that you won't be able to reach us once we have arrived at Queens as there is no mobile signal below street level. Sunday 30th December will be the last bowling session before the break. Bowling Bears has been running almost continuously for thirteen years, but will be taking a break from January 2013 onwards. More details below. Please join our distribution list or like us on Facebook so that you will be among the first to hear of future events. 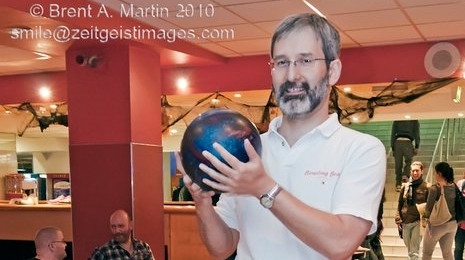 I've been organising Bowling Bears singlehandedly for thirteen years now and I will be taking a break from January 2013. If you've thought about coming, but haven't made it yet please come along now. The best way for you to keep up to date with what's being organised is to join the distribution list or like us on Facebook (or both!). When I plan something new these people will find out first. It's been a great thirteen years and I don't think there's been a single month when the event hasn't run. For a while we ran two sessions a month. We have tried different venues and different days of the week. Sometimes we have had very small numbers, but in the last few years I feel we have had the winning formula of a central London venue where we can go on to Soho afterwards for a drink and a meal. Once, we had so many bears we had to turn some away, but recently fifteen seems to be the average number and because there is always a mix of new and old, singles and couples no one feels left out. My thanks go to the many bears who have come along and helped make these events successful over the years. My thanks also go to Outeverywhere, BearHug, Time Out, Boyz, The Kings Arms, GMFA and the many other people who have helped spread the word about us.